When I gave my very first talk on color many years ago, I mentioned that I had a “secret ingredient” that seemed to work with almost every color scheme I put together. That ingredient was brown. As the years went on I soon realized that it wasn’t just brown but any neutral. Grayed down colors…..browns, grays, khakis, dirty blues, etc. Those are the types of colors we tend to overlook when browsing a quilt shop. We tend to gravitate to the brights, pretty colors and others that grab our eyes. Yet when planning a color scheme neutrals are one of the most important ingredients. I illustrate my point with the images shown here. 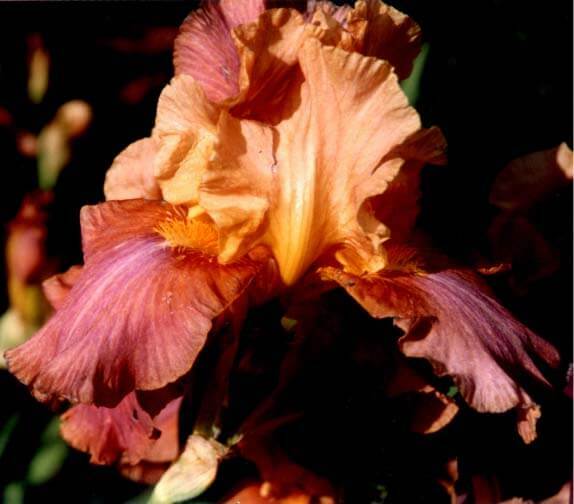 The first one above is a photograph of an Iris that was blooming in my yard one May. When we look at that we just see all the beautiful colors and don’t realize how many neutrals are there. But look what happens when the bulk of the neutrals are removed. Something is lost. Many years ago I designed the quilt Mayflowers for use with the colors I found in the iris. Look at these two images side by side. The first is with the neutrals included in the color scheme and the second is without the neutrals. By far my favorite is the one with the neutrals included. The colors in the second one seem too bold and are lacking the rest that the neutrals seem to give our eyes. So next time you’re designing a quilt or wandering through a quilt shop, don’t forget the neutrals, that secret ingredient. Those neutrals and grayed down fabrics are absent in so many Quilter’s fabric collections. A friend of mine gave me money to buy fabric for her one year she couldn’t attend the seminar.she said you know what I like. I also knew what her fabric collection consisted of. I bought her what she NEEDED and It was those neutrals and grayed down fabrics. Her quilts took on a new life as she used them in her quilts. Great choice and what a wonderful addition to a stash. As Jinny said, they are the secret ingredient. I so agree that neutrals can make the quilt…..but I would like to have the Iris that is pictured! It’s stupendous!